Kiryat Shmona is carrying out maintenance of its bomb shelters, should push come to shove. Civilians in Israel's northern communities are carrying on with their daily routines, but there is tension following the reported attack on a Syrian chemical weapons factory and ensuing threats from Iran and Syria. As of Friday morning, the IDF has not instructed authority heads to take any special steps, but Kiryat Shmona, Israel's northernmost city, has embarked on a project of cleaning and maintenance of its bomb shelters. The Home Front Command noted Thursday that no special instructions have been issued, and there is no need to raise the level of alert. However, the IDF has rolled out its Iron Dome anti-missile defenses in the North, deploying one battery in the Haifa area and the second near Tzfat. 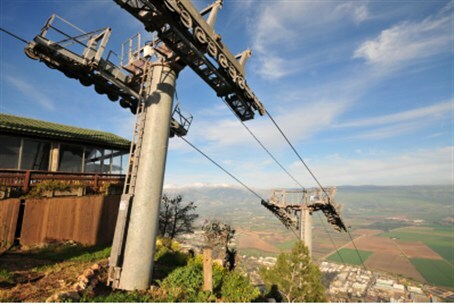 Kiryat Shmona's mayor, Rabbi Nissim Malka, hopes things will remain quiet. "All of the news in the press has had its effect, and people are not calm," he said. "The shelters are ready and so is the War Room. All the forces have been briefed but right now we are continuing in routine mode." The deployment of the Iron Dome batteries and the increase in IAF activity have contributed to the tension among civilians. "There were jets circling in the air yesterday and this morning," Malka said. "People keep asking me what is happening, should we send the children to school, should we go to work, and I tell them to remain calm. "In any case, our PA system is online and that if anything does happen, G-d forbid, we will have several seconds' alert. But I really call upon everyone to enjoy the snow in the Hermon and have a beautiful weekend."